Pompe disease is a metabolic myopathy that is caused by glycogen accumulation as a result of deficiency of the lysosomal enzyme acid alpha glucosidase (GAA). Previously, we showed that adult muscle stem cells termed satellite cells are present at normal levels in muscle from patients with Pompe disease, but that these are insufficiently activated to repair the severe muscle pathology. 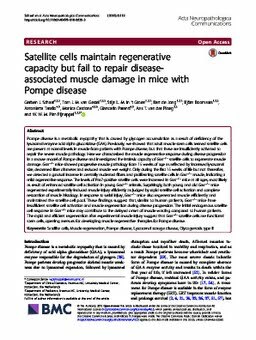 Here we characterized the muscle regenerative response during disease progression in a mouse model of Pompe disease and investigated the intrinsic capacity of Gaa-/- satellite cells to regenerate muscle damage. Gaa-/- mice showed progressive muscle pathology from 15 weeks of age as reflected by increased lysosomal size, decreased fiber diameter and reduced muscle wet weight. Only during the first 15 weeks of life but not thereafter, we detected a gradual increase in centrally nucleated fibers and proliferating satellite cells in Gaa-/- muscle, indicating a mild regenerative response. The levels of Pax7-positive satellite cells were increased in Gaa-/- mice at all ages, most likely as result of enhanced satellite cell activation in young Gaa-/- animals. Surprisingly, both young and old Gaa-/- mice regenerated experimentally-induced muscle injury efficiently as judged by rapid satellite cell activation and complete restoration of muscle histology. In response to serial injury, Gaa-/- mice also regenerated muscle efficiently and maintained the satellite cell pool. These findings suggest that, similar to human patients, Gaa-/- mice have insufficient satellite cell activation and muscle regeneration during disease progression. The initial endogenous satellite cell response in Gaa-/- mice may contribute to the delayed onset of muscle wasting compared to human patients. The rapid and efficient regeneration after experimental muscle injury suggest that Gaa-/- satellite cells are functional stem cells, opening avenues for developing muscle regenerative therapies for Pompe disease.